When CESR first came online in 1979, the accelerator was optimized for high-energy physics (HEP), with a design based on the "FODO" concept: one unit cell was comprised of a horizontally-focusing quadrupole, a dipole, a vertically-focusing quadrupole, and another dipole. This unit cell was repeated roughly 50 times around the CESR tunnel. 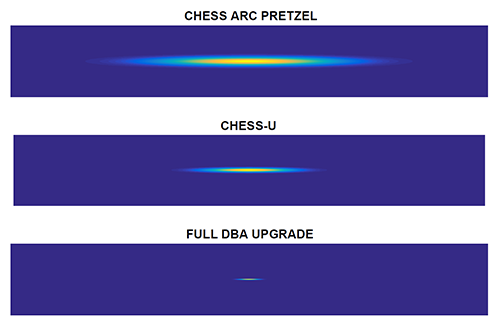 A FODO-based accelerator is very flexible and the design allowed for many modes of running over the following decades, up to and including the present-day "arc pretzel" CHESS operations. Fast-forward 30 years, and now we find the days of HEP with the CLEO detector have come to a close. Although CESR now primarily operates for CHESS, the original CESR design decisions for HEP continue to have an impact. In particular, CHESS was established to run parasitically during two-beam HEP collisions, which is why there are beam lines from both electron and positron sources, and why we continue to run with counter-rotating beams today. However, two-beam operation limits the beam quality (emittance), stability, and beam current; it also poses unique operational challenges compared to a single-beam light source such as APS or NSLS-II. For these reasons, CHESS is exploring options for upgrading to single-beam operation. To allow for additional insertion devices one-sixth of the storage ring magnets, through the L0 / CHESS user area, must be replaced. This turns out to be quite convenient from an accelerator design perspective. In order to make room for the CLEO particle detector in the original CESR design, several stronger dipoles (the so-called "hard bends") were placed on either side of the L0 experimental hall, creating a long straight section. Several of these hard bends now act as source points for CHESS beam lines. Not coincidentally, the hard bend magnets are by far the largest contribution to the horizontal emittance. So, get rid of the hard bends, the emittance drops by a factor of four, and everybody wins. The only remaining question is, what should the new sector of the storage ring look like? There are many constraints to consider beyond the ideal "this design reduces the emittance the most" or "that design makes room for the most beam lines." All components must fit into the existing space, global properties such as the circumference of the accelerator must be preserved, ID straights must point in a direction where a beam line could exist, and so forth. After many iterations between the accelerator design group and CHESS, a design was chosen. The final design uses a unit cell called a "double-bend achromat" (DBA), which is widely utilized in third-generation light sources. DBAs more or less do what they say on the tin: one cell is comprised of two bends, and provide an insertion device straight with zero-dispersion (achromatic). In our design the dipoles will have a vertically-focusing gradient, and two pairs of quadrupoles will provide horizontal focusing. The CHESS-U upgrade calls for six of these DBA cells to fit between the East and West RF cavities, spanning the region from the present-day F-line source to the A/G-line undulators. There are numerous advantages to this design. The unit cell is compact, allowing for a maximal number of beam lines with insertion devices. Its periodicity means the source parameters at each beam line are identical in the baseline mode of operation, yet the individually-powered magnets allow some flexibility in designing custom source parameters without interfering with adjacent sectors. And by getting rid of the hard bend magnets, the horizontal emittance is significantly reduced. With single-beam operations, vertical emittance is also reduced, so the source size is significantly smaller than present-day CHESS. In June 2016 CHESS held an external review of the accelerator design, where experts responsible for the NSLS-II and APS-U designs (among many others) had the opportunity to critique the CHESS-U accelerator design and offer suggestions for improvement. Our design was well-received, and after small adjustments to reflect the committee's reports, the accelerator design was frozen in order to enable prototyping of magnets, the first of which will be completed in January 2017. With the accelerator design frozen, now CHESS can also begin mapping out beam lines and designing end stations to enable the diverse science program put forth in the recent science case workshops. And in a short 18 months, CESR will turn off for the last time in its present configuration, to awaken in the latter half of 2018 as a fully-fledged third-generation light source.